I promise – I had nothing to do with this set up. No one make any phone calls regarding how I raise my kid. If only you knew how hard it is to get this child to eat anything at dinner, you’d understand why I’d be thrilled to have my son chowing down his food in handcuffs. It started when he went to his room angry and mad at the world. This happens on a daily basis probably about 10 times or more. While he is in there cooling off, on a self imposed time out, he usually ends up distracted with lego dudes or something of the sort and returns to the family energetically chattering away about some distant planet with pirate aliens and space ships. Today? I was too tired to chase him to the table, having huffed off to his room just minutes before we were ready to sit down. Dad came to the rescue and went after the boy. Out they came with him happily doing some silly dance, and truthfully I was both annoyed and pleased. (Only dad can manage this – and it completely annoys me). Maybe we’d have a nice Sunday dinner after all, so how this child comes to the table happy I sposed didn’t really matter. 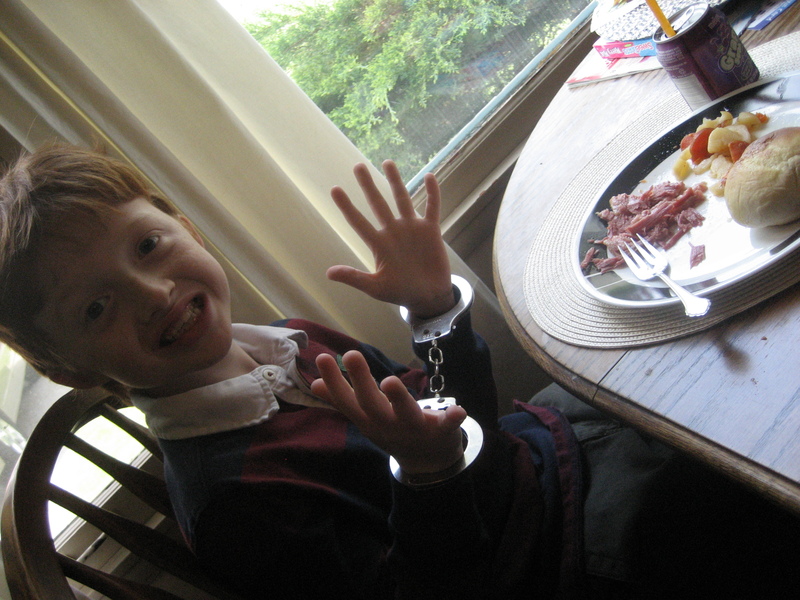 What I failed to notice as we sat down was the boy-bonded agreement in which it would be okay to eat dinner wearing some old fake handcuffs (with bad latches – which you will all read as “SAFE”). Half way through dinner I noticed Drake was eating ALL his food without complaining, never saying how yucky it was, and not asking how many more bites he had to have before even nibbling on the first one. Now this can of course be due to the fact the meal was succulent, and by far one of the best meals we’ve had around here in a long time… but I knew that wasn’t why. I knew it was those rattling wristbands. Each bite had to be maneuvered two handed, and slugging down his grape soda was making me hold my breath. And for THIS he was gleefully eating. It was all a game and story that was playing out in his head as well as “out loud” for us all to partake in. My son has an imagination that is fascinating and far reaching. I am just now beginning to get this mothering thing down a bit. I am a tad more relaxed and less, “it HAS to be this way”, about all the things that come up. If eating in handcuffs gets him eating, why do I really care? We are at home, not out. He’s happy – which means we are ALL happy. I don’t mean that giving in to your child’s whims are always a good choice, but sometimes it really isn’t a battle to be fought. Do I prefer good manners, polite and witty chatter, and dinner eaters who are not jumping about? Of course. But joy doesn’t always have to be contained. Sometimes there are allowances to be made. Life isn’t about getting it perfect, doing things correctly all the time, or even having those darned good manners. Sometimes it is just about “living out loud” – getting out from inside ourselves, having a good laugh, enjoying a kid’s creativity – and loving — loving every single silly minute of it. I confess I am still a novice at fully putting this into practice, but it’s a good concept to work on. One of these days I will get it right, it will come easier, and hopefully all the moments I’ve muted my kid’s when they’ve needed to live-out-loud, will pass from their minds and they’ll remember the times that we DID.